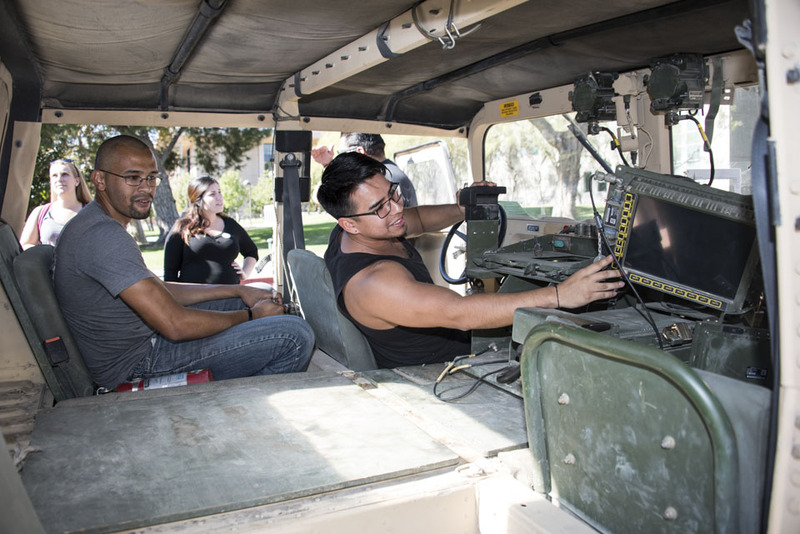 CSUN students visit with veterans and check out a Humvee at a past We ❤ Our Veterans party. Photo by David J. Hawkins. 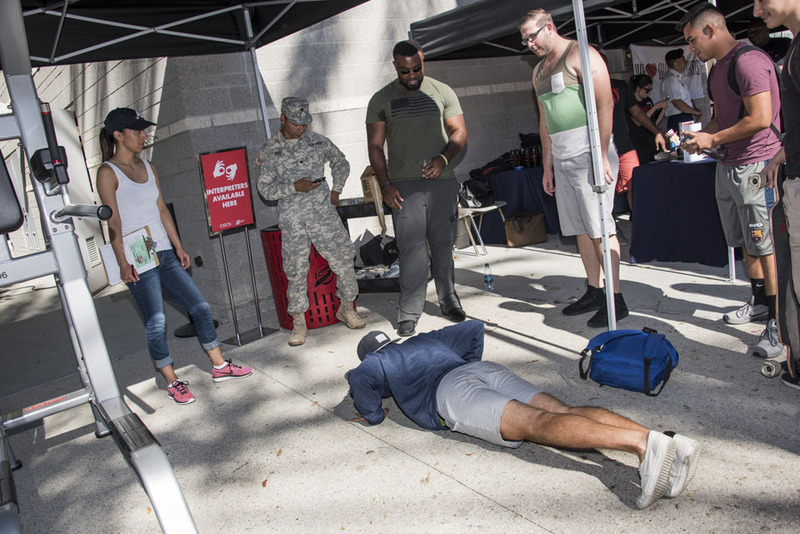 Veterans challenge students to a pushup competition. Photo by David J. Hawkins. 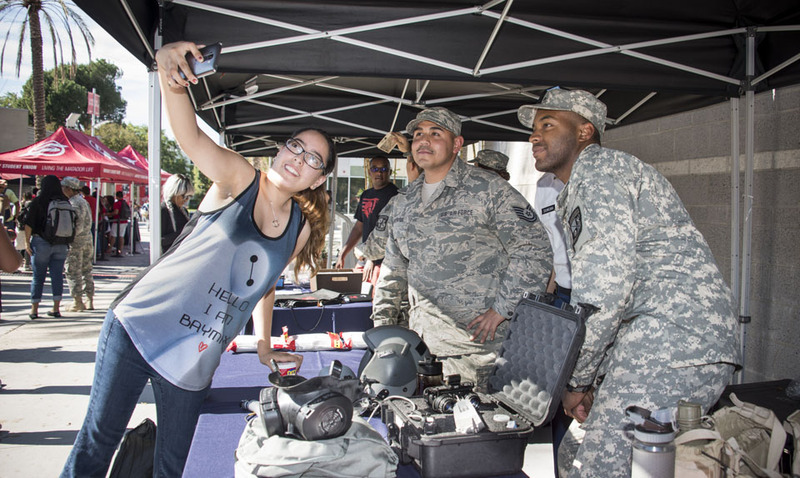 A CSUN student takes a selfie with veterans at the We ❤ Our Veterans party on Nov. 10, 2016 in the University Student Union. Photo by David J. Hawkins. California State University, Northridge is hosting more than a week of events honoring the military service of our veterans. Many of the “We ❤ Our Veterans” events presented by the the Veterans Resource Center of the University Student Union are open to the public. Thu, Nov. 1: CSUN Men’s Basketball vs Cal State LA, Veterans Appreciation Game, hosted by Student Veteran Success Advisory Committee. The game will be at 7 p.m. in the Matadome. Sun, Nov. 4: Annual 5K Fun Run for The Soldiers Project. Sigma Tau Alpha Veteran Fraternity hosts this event at 7:30 a.m. (Check in is at 6:30 a.m.) in the Plaza del Sol, USU. Following the fun run, there is a U.S. Flag Garden Display in the North Sierra Quad Lawn. Mon, Nov. 5: Veteran Ally Training for CSUN faculty, staff and student leaders will be at noon in the Tujunga Room, East Conference Center. Tue, Nov. 6: Associated Students Farmer’s Market: Student Veteran Recognition will be from 10 a.m. – 2 p.m. in Matador Square. Wed, Nov. 7: Veteran Ally Training for CSUN faculty, staff and student leaders will take place at 9 a.m. in the Tujunga Room, East Conference Center. Thu, Nov. 8: CSUN Students and Veterans Party on the Plaza will take place from 11 a.m. – 1 p.m. in the Plaza del Sol, USU. Sun, Nov. 11: The San Fernando Valley Veterans Day Parade will take place at 11:11 a.m. in the San Fernando Mission Boulevard and Laurel Canyon Boulevard in Mission Hills.